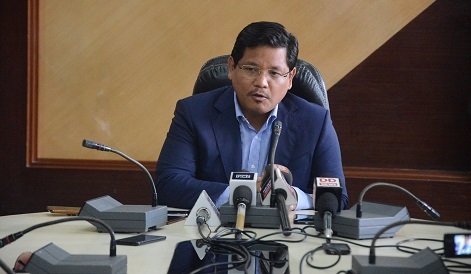 Meghalaya chief minister and National People’s Party president Conrad K Sangma will convene a meeting of all the regional parties from the Northeast in Guwahati on January 29 to have a discussion on the controversial Citizenship (Amendment) Bill, 2016. According to media reports Conrad Sangma, who heads the coalition government in Meghalaya where BJP is also a partner, is likely to chair the crucial meeting on Tuesday to decide where to remain or pull out of the North East Democratic Alliance (NEDA) and the National Democratic Alliance (NDA) led by the BJP. It may be mentioned that massive protests have been going on across the Northeast against the Citizenship (Amendment) Bill, 2016 which seeks to amend the Citizenship Act, 1955 to provide citizenship to illegal migrants, from Afghanistan, Bangladesh and Pakistan, who are of Hindu, Sikh, Buddhist, Jain, Parsi or Christian extraction. The Bill, which was passed in the Lok Sabha on January 8, 2019, is yet to get Rajya Sabha. The movement against the Bill has been joined by several social organisations and political parties in the Northeast. While three ministers from the Asom Gana Parishad (AGP), one of the partners of BJP-led coalition government in Assam, resigned recently in protest against the BJP-led central government’s move to get the Bill passed, the Meghalaya and Nagaland Cabinets have taken resolutions opposing the Bill. The Nagaland Cabinet at a meeting on Monday rejected the Citizenship (Amendment) Bill, 2016. The NDPP-led coalition government in Nagaland also has BJP as its partner. On the other hand, Zoramthanga-led Mizoram government has also vehemently opposed the Bill. Mizoram CM Zoramthanga recently said the ruling Mizo National Front (MNF) would not hesitate to snap ties with the National Democratic Alliance (NDA) if the Bill is not revoked. The NPP in Meghalaya has been pressurised from all quarters to pull out from NEDA and also to drop the only BJP minister, AL Hek from the MDA government, led by Conrad Sangma. In Meghalaya, the regional partner in the MDA government, the United Democratic Party (UDP) on Monday adopted a resolution to oppose the Bill. Lanong also reportedly said the regional parties would unitedly take a call on the issue, whether to remain with the BJP-led NEDA (in Northeast) and NDA (at Centre) during Tuesday’s meeting.